Kirti Monastery in northeastern Amdo Province in Tibet where a monk killed himself in protest against the Chinese government's repression last month [March 2011] is now under military blockade with severe restrictions on the movement of monks and food supply, a US-based human rights group says quoting Kirti monks living in Dharamsala. "The authorities have now imposed a lockdown on the monastery, with a new barbed wire fence and wall being built around the back of the monastic complex, and armed troops within the compound preventing monks from leaving and food from being delivered," International Campaign for Tibet (ICT) reported Monday [11 April 2011]. The authorities have called in Chinese construction workers to build a concrete wall in addition to the barbed wire fence preventing residents to visit the monastery. "As a result the monks are finding it very difficult to get enough food, and have been reduced so far to depending upon the tsampa (a Tibetan staple of roasted barley), butter and so on donated by laypeople, which is distributed by the monastery administration," ICT quoted another Tibetan source as saying. Since 19 March, the monastery's regular programme of religious observances were cancelled, and monks are not even allowed to burn incense for their religious offerings. "Armed soldiers and police with dogs prowl around the monastery by night, beating up any monks they come across," the sources at Kriti monastery in Dharamsala said. Meanwhile, the sources also reported about peaceful protests by Tibetans in Namda township in Dzamtang county in Ngaba on 23 March. 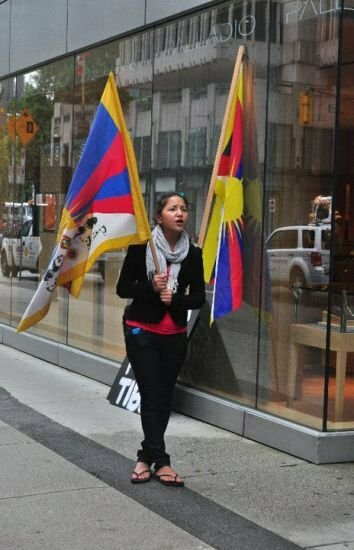 The protesters expressed their yearnings for freedom and return of His Holiness the Dalai Lama to Tibet. "The protest was broken up by police who subjected Tibetans to severe beatings and arrested eight people. Four of them have been named as 40-year-old Palko, a teacher at the township school; 35-year-old Dorje, a local man; Ador, a 35-year-old local man and Osel Dorje, a 28-year-old man. The names of the others are not known, and the whereabouts of all eight is also not known," the sources said. On 22 March armed police detained a group of Tibetans in Tawa in Ngaba County. Those detained were Lobsang Jamyang, aged 16, Wangchuk, Sonam. Other residents of the pastoral communities of Tawa were also detained, although no further details are yet known of their identities, the sources said. On 24 March, 24-year-old Kirti monk named Losang Choepel, from the pastoral area of Kanyag Dewa in Ngaba county, was detained and taken away from the monastery. On 25 March, 27-year-old Losang Tsepak, a former Kirti monk who had been studying at university in Beijing, was detained and his whereabouts are unknown. At around the same time, 32-year-old Kirti monk Losang Ngodrup, from Cha township in Ngaba county, was detained. Neither their current whereabouts nor the reasons for their detention are known, the sources said.